The chaos caused by the incompetence and arrogance of Chicago Public Schools officials put into power since Rahm Emanuel took office in May 2011 was clear as crystal to thousands of parents, students and teachers by the end of the first full week of school for the so-called "Track E" schools on August 17, 2012. But instead of solving the problems they had created, Emanuel and his schools "team" doubled down, threatening critics and setting up what teachers and some principals are calling a "Rat Line" so that principals can "report" teachers and other staff who complain about the chaos and incompetence surrounding them. Coupled with a second year of government by publicity stunt, Emanuel and schools chief Jean-Claude Brizard seem to hope that if the problems don't get sustained attention on TV they don't exist, no matter how widespread they are — and no matter how much Emanuel and Brizard are the causes. "If these people had been in charge 70 years ago, we would have lost World War II," was the way one teacher (who asked to remain anonymous) put it to Substance after reviewing the unprecedented chaos that came with the opening of the 2012 - 2013 school year in Chicago. The response was in the face of the complete collapse of competent administration across Chicago's real public schools during the opening weeks of school for the so-called "Track E" schools (241 schools, about a third of the system). Between August 6 and August 10, 2012, teachers were insulted on a daily basis during "Professional Development" (PD) days filled with meaningless and often contradictory materials from CPS administrators. Then, between August 13 and August 17, when the children arrived in the elementary schools and teenagers poured into the Track E high schools, chaos ensued. 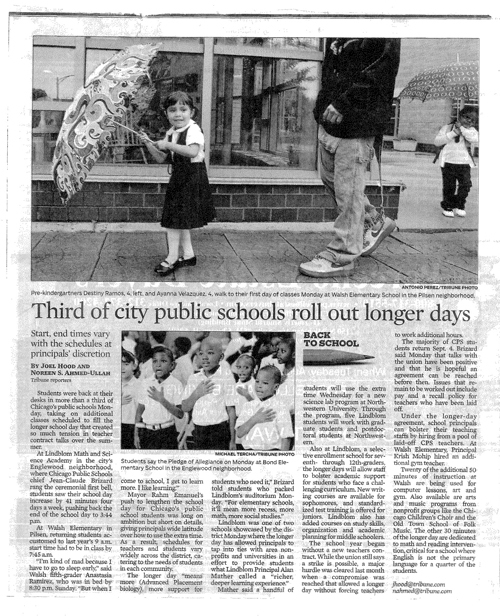 Program changes, lack of staff, and absurd duty assignments (such as special education case managers forced to do outdoor recess duty while special needs pile up) characterize the second school year since Rahm Emanuel became mayor, dumped the entire Board of Education, and began importing dozens of highly paid outsiders to take over the top executive positions in the nation's third largest school system. But for the most part, the chaos caused by Emanuel's massive mismanagement was invisible as Emanuel's massive City Hall and CPS propaganda departments hauled reporters from one publicity stunt to another, usually with the support of the owners and editors of the city's corporate media. Even student sit-ins and protests against the chaos were being ignored. But if the math is supposed to matter a year after Emanuel began feeding talking points based on questionable "studies" of the length of school days in other cities, it was ignored by those who shape Chicago's public opinion as about 150,000 children returned to their public schools. 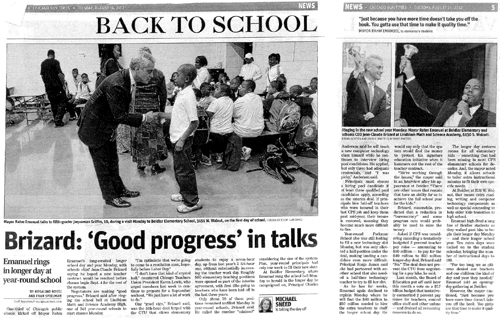 While Chicago's corporate media remain distracted by the latest half-dozen media events brought to reporters by the Rahm Emanuel Show — and the Chicago Sun-Times continues to act as if it will win a Pulitzer Prize for having photographs of the mayor appear on Page One more than any other mayor in history — more than 200 of the city's real public schools have opened to the most incompetent and disrupted version of a school opening in the city's history. While the Mayor's Press Office and the Chicago Public Schools Office of Communications herded reporters to pre-arranged staging points to report on the success of Rahm Emanuel's "Long School Day" at one or two of the city's "Track E" schools as students returned to class on August 13, 2012, a large number of the 241 schools that begin classes in August were in near total disruption because of the incompetence of the Emanuel administration's school board and school officials (brought in from out of town, often with only an MBA degree as a qualification) who caused massive chaos across the city. While photographs of the mayor and Jean-Claude Brizard dominated the corporate media, during the first five days of classes many students had nothing but program changes and other disruptions, all caused by CPS central planning. In many schools, the entire first week of school was undermined, thereby evaporating any supposed benefits to the 'Longer School Day' Emanuel had used to attack Chicago teachers and the CTU beginning in June 2011.And part of the coverup of the mess is that the Board of Education's attorneys, one of whom is now heading negotiations (along with a million dollar outside lawyer on the Board's side), have issued a memo to principals demanding that they report teachers who protest to the Central Office for "investigations." Across the city, CPS officials are disrupting schools as never before in memory. In addition to having driven out more than 200 principals (and replaced them, in many cases, with inexperienced individuals with no CPS knowledge), constant churning of programs and policies at dozens of schools has been confirmed by Substance. But instead of trying to repair the damage they are doing to the opening of schools for the children they claim they care so much about, CPS officials instead have tried to focus pressure on the Track E principals to report teachers who protest to what teachers are calling "The Rat Line" at the Board's Law Office. And while Chicago's corporate media praise and report publicity stunts by the mayor, school board members, and Jean-Claude Brizard, days of lost time in dozens of schools are making a mockery of a year of vacuous talking points about the "Longer School Day." At the end of the first week of the 2012 - 2013 school year and following a year of Rahm Emanuel talk about the need for the "Longer School Day," thousands of Chicago elementary and high school students have already lost a full week of their school year because of the massive incompetence at the top that Emanuel has put into power. The disruptions, reported to Substance from dozens of elementary and high schools that began classes for children and teenagers under the "Track E" program, include constant program changes for teachers and students, the stripping of teachers from key positions at schools, the refusal of principals to staff teachers into positions now that the children have arrived, and an almost complete collapse of many of the key services — from counseling and library to social workers and psychologists — that a large number of Chicago children need if they are to function effectively in the city's public schools. The cover up, which continued as the Mayor's Press Office and the ever-expanding CPS "Office of Communications" pushed out photo ops and other publicity stunts, was effective as of August 17, 2012, when the end of the first week of "Track E" came. This was despite the fact that teachers and students tried to bring the matter to public attention beyond Substance with dramatic direct action, including a student sit-in at Social Justice High School, part of Little Village High School. As you know, we are working very hard to bargain an agreement with the Chicago Teachers Union that is fair to all concerned. While we've made great progress over the last couple of weeks with the CTU, we need to be aware of potential challenges we may face as the school year starts. CTU conducted a strike authorization vote in June and is telling its members to prepared to strike. While we are very hopeful about reaching a resolution and avoiding any disruptions to the school day, we need your help as we begin the school year in order ensure a focus on teaching and learning as we begin the school year for Track E. We are asking you to report any activities that cause a disruption to the school day. You will not need to do any further investigation. Central Office personnel will contact you if additional information or action by you is necessary. While these are lawful activities, you should report them via the e-verify system. Other unexpected activities are possible as well. Again, these are precautionary measures. The Board and the Union need to reach an agreement that both sides believe is fair and reasonable, and we are confident we will achieve that. A strike would be devastating to the Chicago Public School system, and especially to our children. We think all parties realize that they need to work together and reach an agreement as soon as possible to avoid disruptions to the start of the school year. THIS IS A COPY OF AN INTERNAL CPS MEMO TO PRINCIPALS DISTRIBUTED AUGUST 16 OR AUGUST 17, 2012. IT WAS PROVIDED TO US BY AN ANONYMOUS SOURCE AND CONFIRMED. OUR COPY ENDS AT THIS POINT. SORRY. George N. Schmidt. Substancenews.net. Nice job, George. Every veteran teacher in Chicago could have predicted these results weeks before opening day. That's because "veteran teacher" means person experienced in teaching children. You have to keep reporting the details for the parents. I am shocked that the Rat eVerify Memo did not include the wearing of CTU red shirts. Many principals are harassing staff who wear union shirts, including the Southside school that has made the news for leaving an autistic child on the bus for three hours and has TWO male staffers under investigation for sexual misconduct. Clearly this principal found clothing more important than the safety of her students. I am so glad you report the truth! I am so angry at what is happening to this school system. CPS administrators are setting CPS up to fail so they can privatize schools. They are so blatant about it. When a public school system hires an upper administration without a background in education, and whose Board is made up of millionaires who want to privatize education, telling Principals to tattle on their staff for having an opinion, etc. I used to work at a private school that added Board members who had no background in education and implemented ridiculous policies and never identified a mission statement. They laid off about 20 employees at the end of their first year who complained and didn't follow their "mission". What mission? This is the same thing that is happening within CPS. I have no respect for Rahm. You are exactly right about chaos leading to privatization. Brizzard's playbook comes from the Broad Foundation training he received. Rahm knew exactly what he was getting when he saved Rochester from Brizard — a man who would manage to absolutely destroy a public school system by creating chaos, and then making a case for "doing a New Orleans" on the system. Brizard doesn't care about the kids, Penny Pritzker doesn't care about the kids, Rahm doesn't care about the kids. What all of these operators care about is handing over the public commons — as well as the tax base — to a bunch of one percenters. Everything else is just cover for this transfer of tax money from the public to the already wealthy.